(Millbrook, NY) Ecologists have long known that agricultural and sewage pollution can cause low oxygen conditions and fish kills in rivers. A study published today in Nature Communications reports that hippo waste can have a similar effect in Africa's Mara River, which passes through the world renowned Maasai Mara National Reserve of Kenya, home to more than 4,000 hippos. Co-author Emma Rosi, a Freshwater Ecologist at the Cary Institute of Ecosystem Studies, explains, "Together, the Mara's resident hippos add about 8,500 kg – or 9.3 tons – of partially digested plant material into the river each day. We were interested in how this massive influx of organic matter and nutrients influenced aquatic life." 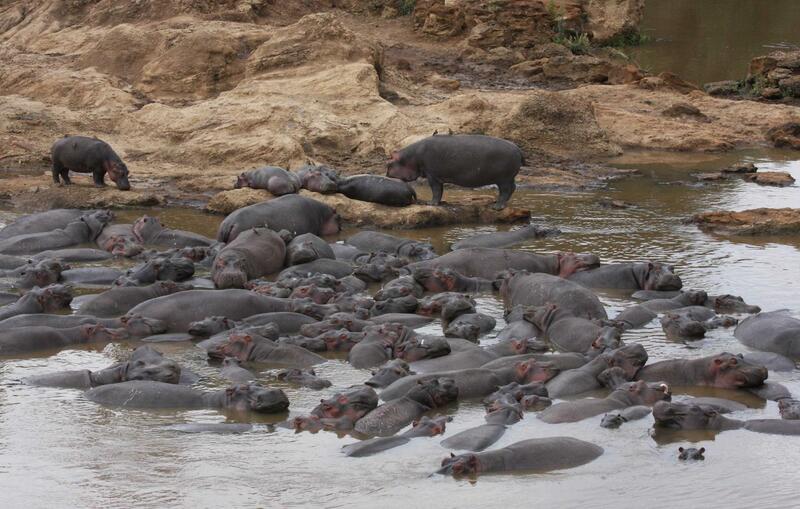 "During dry periods, oxygen-poor water accumulates in hippo pools. Periodic intense rains eventually flush the water downstream. This sudden pulse of deoxygenated water can cause temporary hypoxia and fish kills," notes Rosi. This research suggests that altering a river's flow regime through dams or water withdrawals could have ecological consequences in African rivers with hippos. Coauthor David Post of Yale University explains, "In the Mara River system, flushing flows are important for cleaning hippo waste out of pools, but the accumulated toxic chemicals and deoxygenated water have severe impacts on aquatic life downstream." Lead author Christopher Dutton of Yale University explains, "There's this idea that pristine rivers are not supposed to have dissolved oxygen crashes, but we think this is because generations of scientists have studied places that no longer have intact large wildlife populations, whereas the Mara River is unique because it does. This system offers a window into the past and illustrates how ecosystems might have functioned before human impacts." Funding for this research was provided by the US National Science Foundation, the National Geographic Society, the Yale Tropical Resources Institute, the Lindsay Fellowship for Research in Africa, the Yale Institute for Biospheric Studies, the Yale MacMillan Center for International and Area Studies, and the Robert and Patricia Switzer Foundation.